If you have a concept of your website in mind and you have chosen a theme to work with, you can setup your WordPress in a matter of minutes. But what after that? Back on its initial release on May 27th 2003, it was just a few lines of HTML used as a typography tool for bloggers. 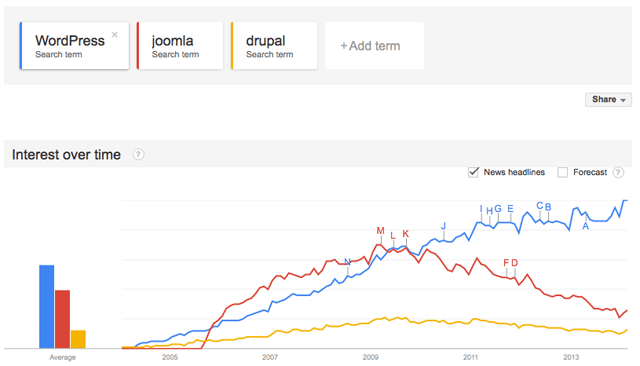 Now, WordPress is by far, the most popular content management system (CMS) in the world with over 46,000,000 users. According to Matt Mullenweg, founder of WordPress, around 18.9% of the whole web is now covered in websites launched on WordPress. From the release of its latest version, WordPress 3.8 in December 2013, it already has over 17,000,000 downloads. Originally imagined as a blogging platform, due to being free and open-source, the interest of its users and their engagement in improving it, WordPress soon became a full content management system and a platform for almost any kind of website. A large community of WordPress users is constantly engaged in improving the process of creation, functionality and the visual experience of WordPress, adapting it for any purpose intended. There are thousands of customizable themes and over 29,000 plugins (I have created 4 plugins for WordPress.) for solving any kind of functionality issue you may encounter. If you have a concept of your website in mind and you have chosen a theme to work with, you can setup your WordPress in a matter of minutes. It really doesn’t take away much time, even if you have basic to intermediate knowledge of HTML and PHP. It is a user-friendly platform created for users, by the users. That is what makes it perfect for any user who would like to present himself, his cause or his business online. This generally happens because of the various plugin downloads which are not incorporated within the original theme. Because of the constant rise in demand on the market and the ever-growing competition, most plugin developers abandon their projects because of their low success rates and pass on to the next one. This causes a clog with a great deal of plugins, incompatible to the new WordPress versions and their fail in functionality. (The best example is my GetResponse Slideup plugin which never gets the same attention and updates as Aweber Slideup or Feedburner Slideup plugin) If you haven’t updated your plugins regularly and you have not found a replacement for the outdated plugins in your directory, you will have a bad time. Every second of your website down for “renovation”, you will lose serious amount of traffic and potential subscribers which will greatly reflect on your ranks and presence on the web, as well as your budget. Keep your plugin database minimal, clean and regularly updated. Stay on-track with developer’s changelogs concerning the specific plugins. If you see that it has been a while since its last update, contact them and confirm that the plugin be updated. If not, research for new solutions and keep them on your watch-list. The “backing-up” content is also an essential part of web business because of the possible server failures or other hosting problems. If the server should fail at any moment, there is a possibility of losing all your website content. There are number of plugins available for download which you can be used to backup your blog. VaultPress by WordPress guys is one of the best option but it has a recurring cost but there are other plugins like Smart Backup to get WordPress backups done from the WordPress Admin area. Keep in mind that choosing the right hosting plays a great role in your decision of how often you need a backup. Some hosting provider’s offer regular backup as an option as well. Performing regular backup of your content will allow help your website to work smoothly and with peace of mind. Regularly updated blogs for example, with a post on a regular basis, tend to pile up over the years. Each post becomes a new URL added to the link hierarchy on your website and over time, it becomes hard to organize and maintain. This is one of the reasons why you need to prepare an archive of your blog and categories. A great Archive page is possibly an option in most of the themes these days but if it is not provided in the theme you are using, you can always opt for Table of Content plugin. When you have high traffic on your website, it makes it hard to track all the spam content that ends up there. In order to avoid compromising the social engagement of your visitors, disabling comments on your website is out of the question (Though some highly successful bloggers prefer it that way). However, if you are running a serious website and tend to maintain professionalism and focus the visitors flow to the stream of the niche-specific subject, you cannot allow blatant and irrelevant comments. This becomes even a more serious problem if you run a highly visited blog with a great number of contributors. Contributor registration without monitoring and authority can turn into a nightmare of spam in posts and comments and this can seriously affect your link structure and pull serious penalties by web crawlers. Here, there are also numerous anti spam plugins like Akismet by WordPress and many other plugins which can help you filter spam on your WordPress website. Social networks are one of the driving forces of your WordPress website’s traffic. Posting content updates of your website on your social network pages will greatly increase its visibility. You can organize social media marketing campaigns and connect your website to the social networks – however, this option requires hiring more people. Engaging with audiences on social networks can be time consuming and tiresome for an individual. Parts of the process can be shortened by installing plugins Jetpack Sharing Plugin which will automatically post your content on the social networks you are connected to. This will not only save you time, but will also remove the need of hiring people to do this for you.